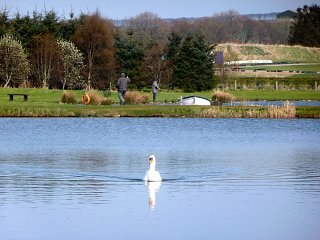 Against the backdrop of blue skies but with a northerly arctic breeze, there was a very good turnout of anglers for our Spring Singles Competition. It was encouraging to see many new faces lined up to pit their skills against some of our hardened stalwards of these events. There was a lot of good banter and laughter in what is a very friendly and hard fought competition. The outcome could not have been closer, with 3 competitors tied for 1st place on 16 points. To explain the marking system, each competitor gets 2 points for the first fish they net at each peg and then 1 point for every other one they catch. Where there is a tie we then resort to the dreaded count back system, where the person with the best result at the 1st peg gets given the nod. In this case our winner on the day was Greg Leslie, 2nd Peter Wilson and 3rd Tommy Graham. Other notable scores were James Mclean on 14 points, Bill Bain and Michael Leitch both on 12 points, Bill Wood on 11 and Scott Mason on 10 . Well done to everyone who took part in conditions that were colder than our last competition which was in January! The cold weather put paid to any ideas of early season dry fly sport as the fish were certainly keeping their “Heads Down”. However good sport was certainly had with the fish fighting extremely hard in the cold waters that they like.Tactics for the week seemed to be split evenly between lures & buzzers. Graeme Garioch had a splendid day netting 31 fish on an ace of spades, Peter Young had 20 changing from yellow dancer to buzzers, as they came on & off the feed, and this included a 15 lb & 12 1/2 lb fish which both gave him a terrific scrap and were returned to the Muckle Troot to fight another day. Other tally’s for the week were Nathan Hutchison 12 fish on yellow dancer then buzzers, Davy Mair 18 on the deadly small semtex lure, Paul Webster 8 fish on diawl backs & buzzers, Bill Wood 8 on blobs & buzzers, Martin Crawford 7 on buzzers & diawl backs, Sandy Murdoch 6 on a tadpole.